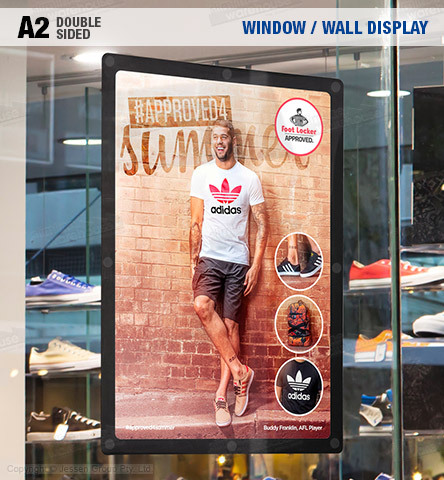 Place display on clear glass to create dual-sided display & reach more visitors! These self adhesive sign holders, like window display poster holders, make it easy to have promotional posters on display at your location. There are clear adhesive dots on one side of the display that are invisible once the frame is securely pressed against most non-porous surfaces. These dots are meant for use one time, and will securely hold the frame once applied. The self adhesive sign holders are designed to be used as a single or dual-sided display. Each side has a clear window to show posters, making it especially effective when placed against a glass window or door to be seen by more people. The wall mount poster frames can also be displayed against a wall and used as a standard single-sided display. There are magnets within the frame that securely hold your poster in place and allow poster changes without any tools necessary! You can display A2 (420 x 594mm) standard sized posters in portrait or landscape orientation within the frame. Some businesses that have already purchased this display are exhibition halls, retail stores, restaurants, cafes, real estate agencies, and car dealerships. Orders made by 2pm EST will despatch same day to anywhere in Australia when in stock!